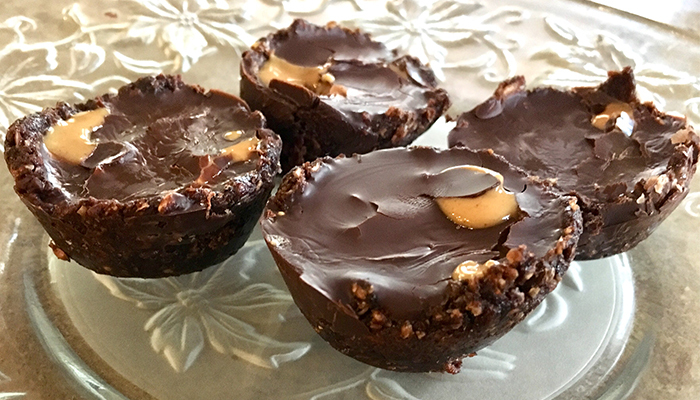 Move over Reese’s: here’s a healthier twist on your favorite chocolate peanut butter cups! These little guys are not only super easy to make, but taste absolutely d’LISH-ous. Eat them post workout or save them for a late night snack. Either way, this vegan recipe takes your favorite NuGo bar and elevates it into something you’ll love! Cut NuGo bar into 4 equal sized pieces. Lightly spray pan with oil. Place dark chocolate and coconut oil into a small bowl and microwave until completely melted. Put the tray into the refrigerator or freezer until melted chocolate is firm.